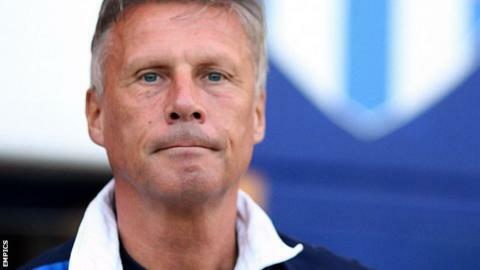 League One Colchester United have sacked manager John Ward after just over two years in charge. The U's have yet to win in nine league and cup games this season and currently lie 22nd in the table. In a statement on the club website, chairman Robbie Cowling said the club had taken the decision with regret. "So much of Colchester United is better than it has ever been, but sadly that is not being reflected in first team results," Cowling said. Assistant manager Joe Dunne will take over in the short-term. Ward, 61, took over at Colchester in May 2010, following the departure of previous manager Aidy Boothroyd. He has previously managed York City, Bristol Rovers, Bristol City, Cheltenham and Carlisle United, and earlier in his career had been assistant manager to Graham Taylor at both Watford and Aston Villa. Cowling said while the club had changed for the better in many areas under Ward, the board had decided to act "to stop the negativity of the on-field results impacting on the other areas of the club that have also been drastically improved".